On Friday, June 2, Church Women United invited the Interfaith Hunger Coalition to make a presentation about hunger in New Mexico. A team comprised of Joy Dinaro, Ellen Buelow, Brenda Sinfield, Ari Herring and Kathryn Arndt were up to the task. 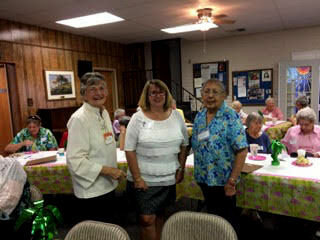 Joy presented a powerpoint with statistics about hunger in our state and photographs and information about the IHC. Ari spoke about the work of the Rio Grande Food Project in addressing hunger in the South Coors area and southwest Albuquerque. Ellen and Ari organized a letter-writing activity urging our federal representatives to protect funding for the Supplemental Nutrition Assistance Program (SNAP). 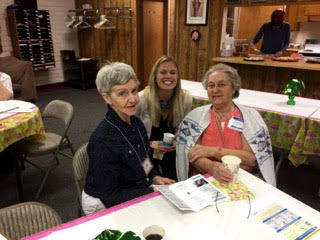 "We circulated among the women before the formal meeting began—handing out the IHC pamphlet and the Kids Count (poverty sheet) This group was well informed about hunger issues in New Mexico," said Ellen. "I believe that James Jimenez (director of New Mexico Voices for Children) spoke to them last month." 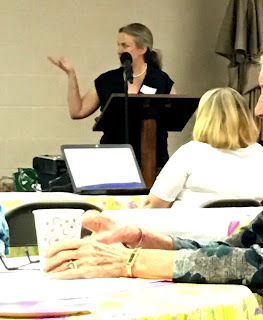 Thank you to Ellen and Ari for the photographs used for this blog post. 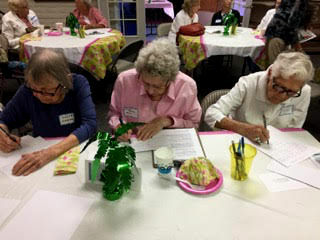 Participants at the Church Women meeting wrote a total of 17 letters to Rep. Michelle Lujan Grisham, Rep. Ben Ray Lujan and Sen. Martin Heinrich. Ellen and Larry Buelow are going to deliver the letters to the Washington offices of our elected officials during Bread for the World's Lobby Day on Tuesday, June 13.